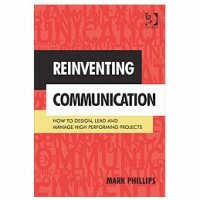 This highly original book looks at two perennial issues faced by projects of all kinds: how to create an environment of high performance for the people working in it and how to manage project complexity. The concept of the book is that “people produce project outcomes and communication creates the environment that people work in”. Its focus is the application of a scientific method to improving project outcomes through understanding how people use the project’s artefacts and from that, how we might “develop rigorous and robust tools” to manage project performance through a new approach to understanding of what causes project performance. It is possible to track and measure communication through observing behaviours of people who receive the communication. People are the source of all uncertainty in a project. When dealing with people there is no single solution – particularly when dealing with a group of people. The project’s orientation toward uncertainty—whether tame, messy or wicked—will influence the design of the project environment and affect how the project and its people will deal with that uncertainty. This book is innovative and original which makes it a worthwhile read because through drawing on ideas that many of us are not familiar with, it opens our minds to new ways of thinking about old problems. This is a different way to view a solution path to the perennial question: what makes projects succeed? Who’d benefit? Leaders of complex projects and programs who are seeking a new approach to using communication to engage stakeholders and to improving project performance through an innovative way to distribute information. There is detail within the book to support the approaches it describes. Project managers with limited experience will benefit from the descriptions of how people are key to project success as this important concept is often overlooked in the project management guides and standards. These project managers will also benefit from an understanding of Phillips’ approach to dealing with uncertainty. Can communication be a ‘rigorous performance management tool’? All projects are social environments in which a group of people are expected to work together to deliver the outcomes of the project to the satisfaction of stakeholders. This is best done through recognising that important stakeholders must be engaged and relationships built: relationships are built through appropriate communication. Is this the same communication that Philips is talking about? It must be; he describes communication as the sum total of gestures, tone of voice, actions, words, pictures, reports etc. I agree with this and with the assertion that people are key. It is people who do the work, make the decisions, cooperate or not, work together or not. People are unique; no person is the same as anyone else and may even vary on a daily basis. Reconciling the gap between individuals and metrics is an issue to be addressed as part of implementing the ideas in the book. Any project manager will benefit from exposure to these highly original ideas about project performance and the importance of people to project success. Anyone who wants to apply the ideas in their own project will find enough detail to try them out. This book is rich in ideas, but the ideas are made accessible through examples to illustrate the ideas and enough detail to apply within your own organisation. Remember, though, that application of ‘soft skills’ in the form of recognising who is important and how best to engage them is still important: a fundamental underpinning of any actions arising from the inspiration of this book.